A £60m project to construct five new leisure sites aimed at getting more people active in Slough has been completed. The Centre, featuring an eight-lane swimming pool, is seeking a 4,000-strong membership, double the capacity of the Mortem Centre it is replacing. It is part of the Get Active strategy, which the council said would "get more people, more active, more often." Slough has higher than average child obesity levels in the region. The Centre, which has a pool-side sauna and steam room as well as a four-court sports hall, is the last leg of the spring 2015 project. Forty percent of Slough's primary school children were recorded as overweight; higher than the South East average. The council said the Get Active strategy would help to ensure physical activity became a habit for residents. 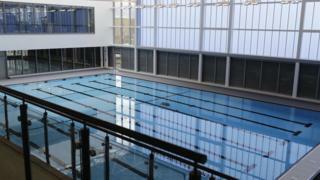 Councillor Rob Anderson said: "Our leisure options in Slough are now second to none. "The Centre will join Arbour Park, Slough Ice Arena, Salt Hill Activity Centre and Langley Leisure to complete our impressive provision of state-of-the-art leisure facilities in the town. "Our broad range of leisure options means there really is something for all our residents to use and enjoy."